The B-26 Marauder was one of those lucky aircraft whose designers got it right at the first try. Though early versions were considered 'widow makers' because of the high landing speed of the B-26, the Marauder went on to have one of the lowest loss rates of any of the USAAFs medium bombers during WWII. Ordered into production right off the drawing board, the B-26 was considered a 'hot' machine to fly. It was fast, well armed and able to deliver a sizeable bomb load. The aircraft was the backbone of the 9th Air Force's assault on Germany. Despite seeing combat for the first time in the Pacific theater, the Marauder was quickly removed and replaced by the B-25 for Pacific duty. 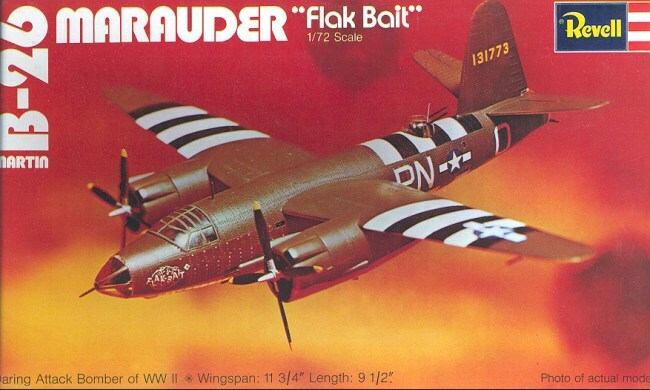 The subject of this kit is "Flak Bait", a B-26B-25 that survived the war and 202 missions. She amassed over 1,000 hits during her career with the 332nd Bomb Group. She flew two missions on D-Day and garnered over 717 combat flight hours. Truly remarkable for an aircraft that was considered to have a life of only a few hundred hours. You can see the nose section of this aircraft in the World War II gallery at the Smithsonian Institution Air and Space Museum in Washington DC. Revell's kit is very much a child of the 60's. It has all the traits that were in vogue during that time. First thing you will spot are the mass of rivets all over the aircraft. It also has engraved panel lines and operating turrets. One thing missing is the moveable control surfaces! Molded in olive drab plastic (to cut down on painting), the kit is remarkably flash free with only a trace on the sprues and almost none on the parts. You can see representative sprues in the image above. Parts are relatively well detailed. There is a full cockpit with seats and control stick. No instrument panel or decal, only directions to paint the area in front of the crew flat black. You do get two crew members for those large seats. There is also a half gunner (fortunately, the top half) for the top turret. The nose side guns are separate and there are no lower waist guns. 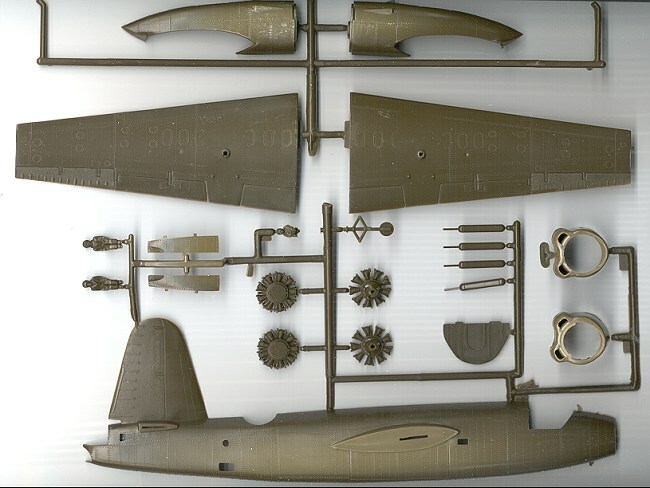 The rest of the parts are perfectly adequate for the kit, though the landing gear looks a bit spindly and may not be able to handle the large amount of nose weight this kit will require to sit on its landing gear! The instructions are very good and consist of 4 building steps. Each part is listed as is the required color at various stages. It is interesting to read a sheet that isn't chock full of various warnings and international icons! 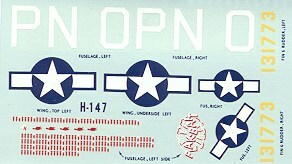 The decal sheet is for one aircraft. Even after all these years, it has not yellowed. It is quite matte and looks like it is starting to crack a bit. A coat of decal film should help to preserve these 27 year old decals. Registration and clarity is very good. It is odd that Revell have not reissued this kit. Maybe it is because there are so many other B-26 kits on the market or perhaps this one did not sell well. I cannot comment on its accuracy or how well it builds. Maybe one of our readers can supply that information.